This is the fourth of five green tips where we look at ways to transform “useless” junk mail into stylish and free gift wrap. This junk-mail wrap art is so much fun it may just have you pinching yourself in disbelief at the free treasures dropping in your mail box each day. The good news is that this fun can go on year round. There’s no reason to stop wrapping gifts with junk mail when Christmas is over. In January, start looking for Valentine’s Day imagery and save your favorites to surprise your loved ones with your clever artistry. Whatever holiday is just around the corner will be anticipated by the ad industry, and provide you with the raw materials to work your magic. Do you have a family or friend’s birthday coming up? Keep your eyes open for ads that reflect their unique interests, whether it’s the outdoors, fashion, sports, or music. There is an excellent chance you’ll find just the right imagery in your junk mail. We were curious how wrap artist John Boak (featured yesterday for his crazy credit-card ribbon and also above gift on the right) got started with his imaginative wrapping, so we gave him a call. Boak said it’s a been a lifelong passion of his to make collage art from found objects, including wrapping gifts in ever-imaginative ways. Take a spin around his site and you’ll see the many wonderful and wacky wraps he’s done. Many are easy enough that any non-crafty person can do them, but Boak also gets adventurous and has been known to pull out his power saw to reshape bottles into just the right sculptural container for his gift. (I found myself musing over whether the wrap is better than the gift itself. As a child I recall wrapping gifts in very elaborate and tricky guises to fool my sibling’s as to the contents.) If you want to learn more, Boak has written a book on Wrap Art (2007, Blurb). Yes, apparently people all over the world are curious about this art form. Over 9,000 people checked out his site last month. That’s 9,000 people who are whether they realize it or not helping to make the world a little greener by reusing junk mail. Now that is a green gift! This is the fourth of five green tips Franke is writing for PlanetGreen, the bouncy offspring of Treehugger.com and Discovery Channel. 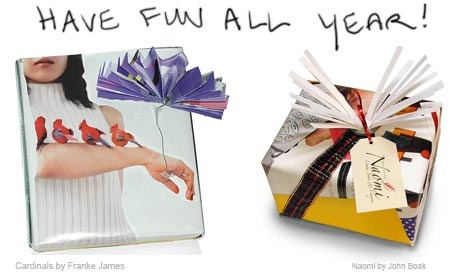 Photos of junk mail gift wrap by Franke James (or as credited); Ads featured in gift wrap were from unsolicited mailings or newspaper inserts.